I am someone who thinks change is good. I love a good change. I think in this life I have found that saying yes to the Universe is the best way, rather than trying to keep everything the same. And that is a poncey way of saying I made something new this week. 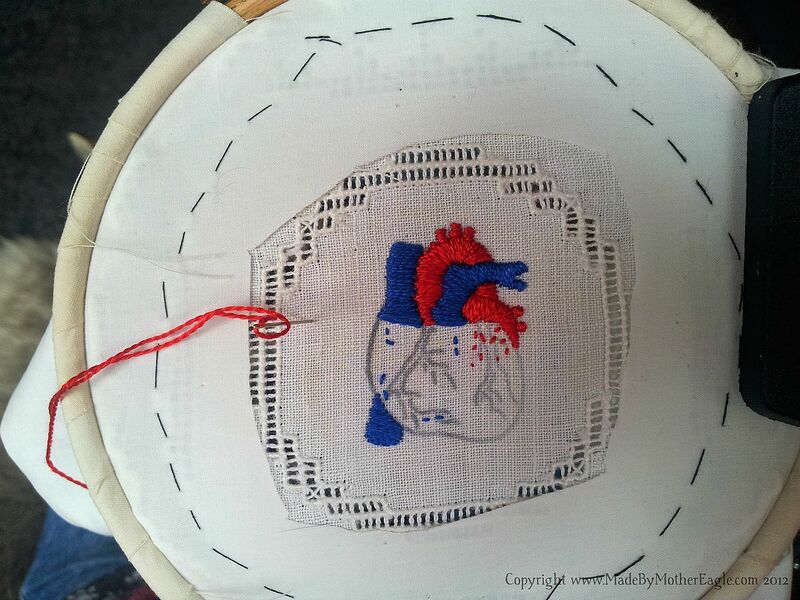 I had a couple of small, 6″ squareish cotton (it might be linen) lace doilies, and I took my little heart design and transferred the design to the centre with my transfer heat pen. This doily is about 50-odd years old. 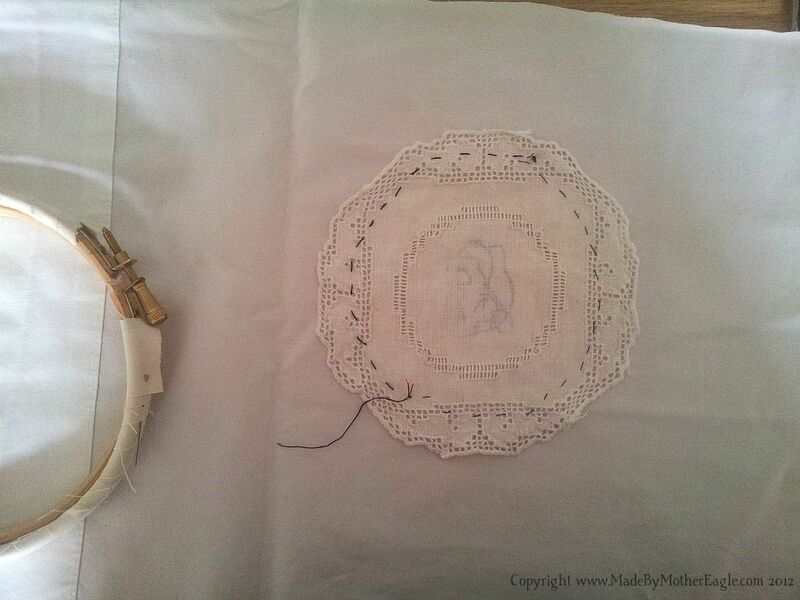 As the doily was just within the fave 6″ hoop’s diameter, and because I wanted to protect the lace edge from too aggressive stretching, I tacked it onto a bit of pillowcase. I then hooped it up, getting it all nice and tight, and then cut an aperture through the pillowcase, like a ham-fisted butcher. 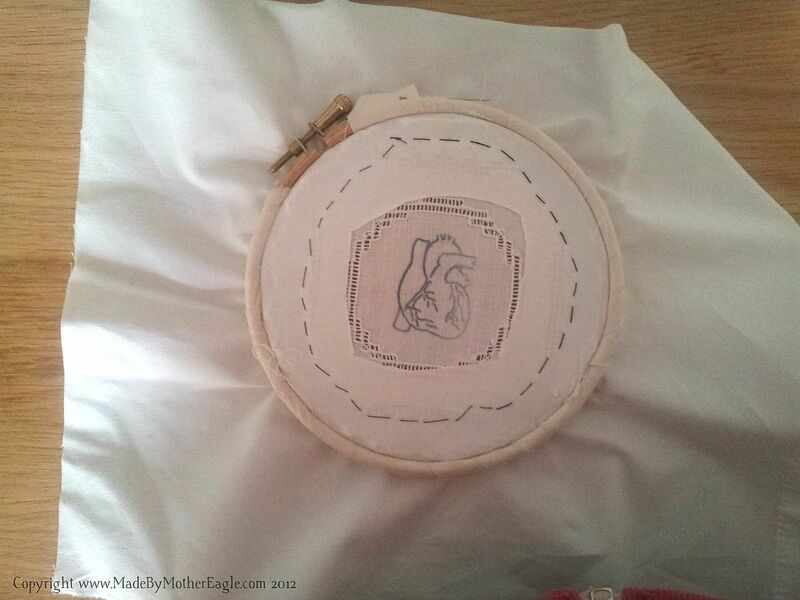 Then I can begin the embroidery – essentially a larger version of my mini jewellery ones. 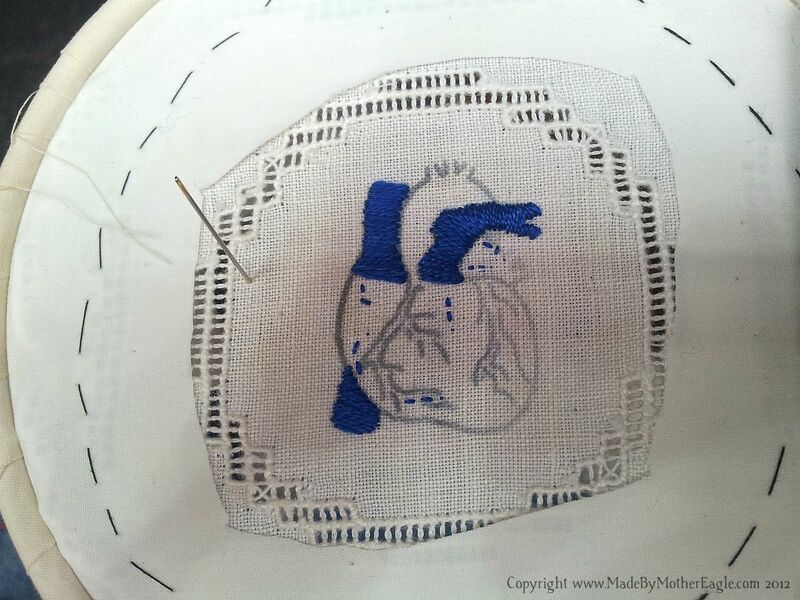 Using electric blue silk I satin-stitched the Vena cava and such. 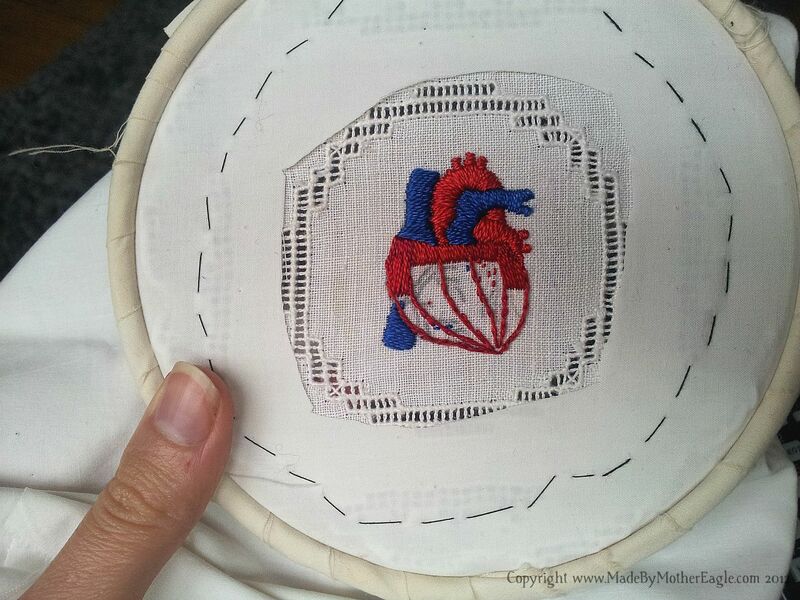 Then continued in blood-red silk to do the pulmonary artery and aorta. I am using a Sharps needle FYI. That done I switch to my fave variegated Poppy silk for the muscle. I am split stitching this bit. 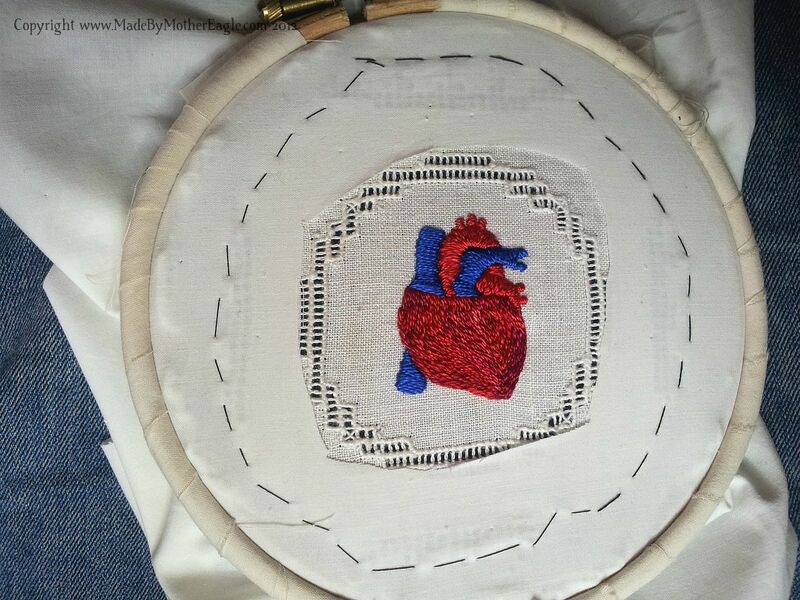 I used a burgundy silk to back-stitch some veins, some darker shades to add dimension to the arteries and veins, and then used fine cotton to outline the lot in backstitch. Forgive the crap photo, will fetch a frame and do some glamour shots ASAP. And I will be adding this to my shop, as a one-of-a-kind piece. What do you think please? My heart most definitely is in this. The anatomy looks lovely with the lace. I love the poppy silk- the color is so vibrant. Wow, that is gorgeous! 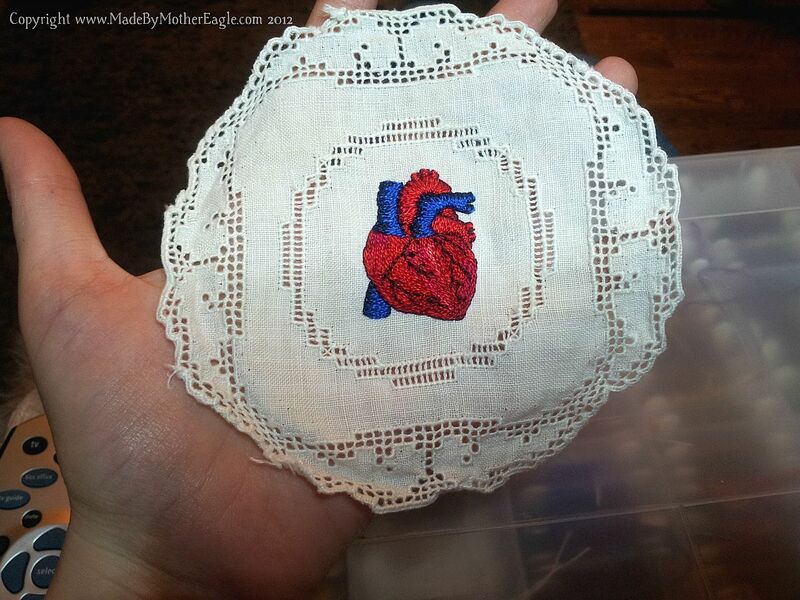 And I love that you are up-cycling some doilies – fantastic! 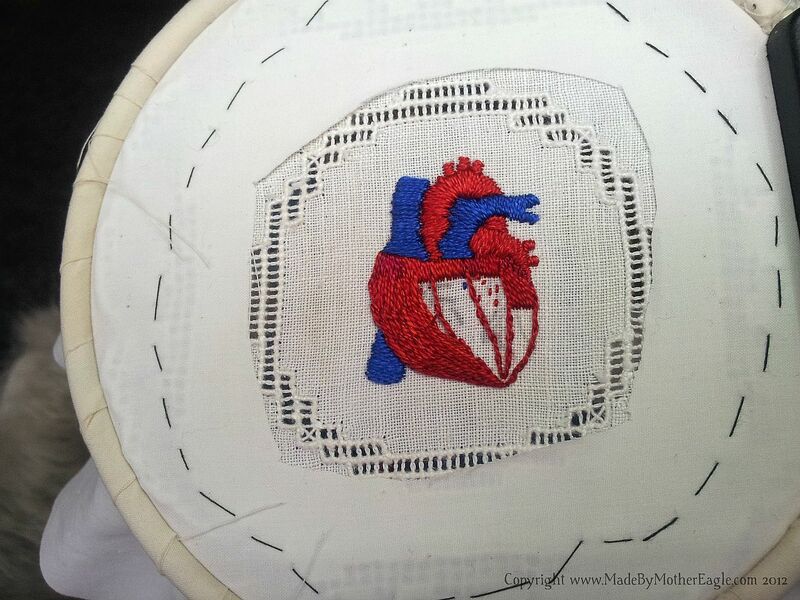 Amazing, the heart looks so so good! And bravo for doing something with your antiques, must say I’m so terrified of stitching onto mine, I can’t possible imagine being able to add to the gorgeousness, instead of ruining it! Haha. These are great though. Plans for a series? Thank you Mei! Yes indeed I have plans for the rest of my collection of antique doilies… My mum works in a thrift store so she also comes across lots of vintage fabrics…so I get a lot of options! It has taken me about ten years to get to work on these though! 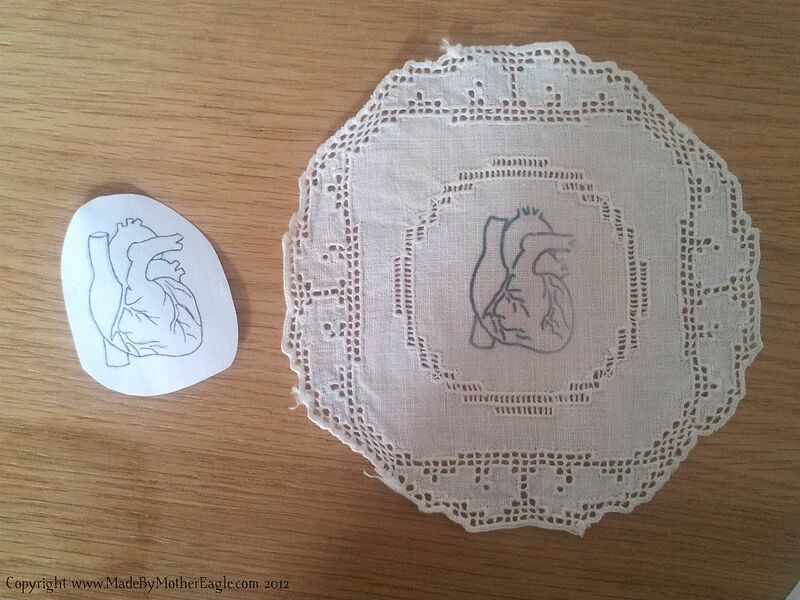 that’s so lovely, I really liked that design in miniature but it works so well with the design in the doily. Really lovely stitching too.